Before you start exporting to Xero UK, please ensure you have an active Xero Payroll subscription for the company, and that you have both the Payroll Administrator and Advisor permissions attached to your account. You may check your permissions by going to Settings in the top right corner, then clicking General Settings, then Users. If you do not have the relevant permissions, you will not be able to see the options to adjust pay. The administrator of the account may add this for you. 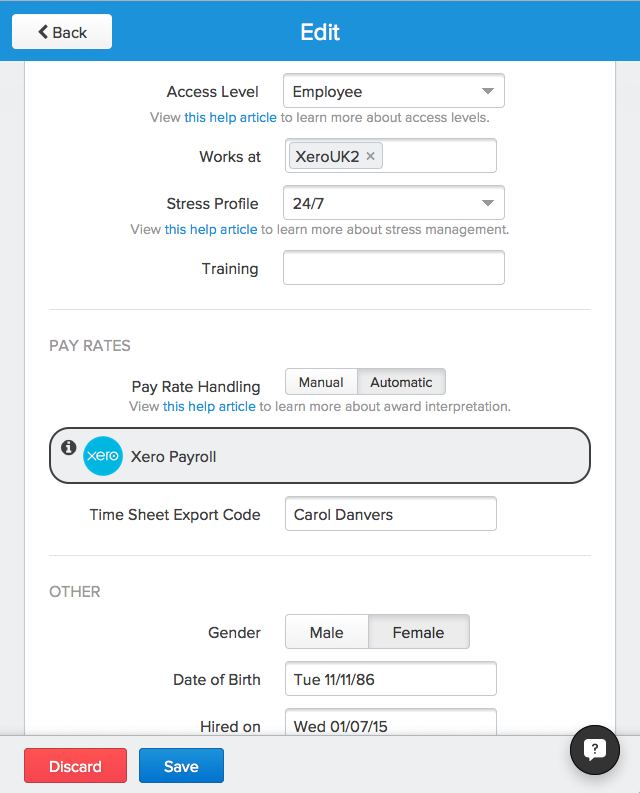 You will need to have your employees set up in Xero to begin with, meaning you will need to finalise their setup under the Payroll->Employees section. This involves completing the Details, Employment, and Taxes sections. To finalise employee creation, you must assign their Wages & Salaries item. These can be created as shown later, and you may change which one the employee has assigned. This will be further explained below. During this step you will also assign an employee their Payroll Calendar, which governs the period you may export their timesheets for. You may adjust this in Xero. Please note that while Leave can exported to Xero UK, we do not yet sync leave balances to Deputy. Your employees are matched between Xero and Deputy based on their full name and email address. If an employee does not have an email address, please set their Timesheet Export Code as their full name. You will also need to connect your Deputy account to your Xero account. To do so, please go to your Locations tab in Deputy. Next, please click "Settings" on the right. After doing so, please click "Payroll" on the left side. You will see there a list of payroll systems. Please click "Connect to Xero" next to Xero. Doing so will create a popup for you, so please ensure that your browser has pop-ups enabled. In the popup, please select the Xero account you'd like to connect to. After selecting it, please click "Authorise". Doing so will connect the account so that you can share data between it and Deputy (and vice versa). After setting up your employees, you'll need to create their pay items. After creation pay rates can be assigned as Wages and Salaries in the employee's Pay Template. To create one, first please click "Settings" at the top of the screen, then select "Payroll Settings". After doing so, please select the "Pay Items" tab. Once you're on the Pay Items page, you can create a new rate by clicking "Add Earning Type" on the right. Here you can give the rate an Earnings name (how Xero will recognise the rate), a Display name (how it will appear to the employee on the payslip, it's Earning category (what type of rate it is) and the Expense Account. If you are exporting Deputy you will need to set up the rates in Xero using Regular Earnings, Overtime Earnings, or an Allowance. Xero will assign rates based on their name. In it's more basic form, this refers to weekday, Saturday, Sunday, and Public Holiday rates. If you name a rate "Weekday Hours" for example, the system will apply it to that employee's hours worked from Monday to Friday. Saturday can be Sat or Saturday. Sunday may be Sun or Sunday. Public Holiday should be PH. If this naming scheme is not used, the system will apply the employee's Wages & Salary item as the default. When you create a Pay Item, please note that although you may assign it a value per hour on the creation page, you may also apply it manually to an employee. This means that you may use one Pay Item for multiple employees, even if those employees are paid differently to the rate specified at creation. If you require more complex rates than the above (like night rates or overtime, for example) you may use our Award Interpretation system shown here. If you have any questions please reach out to one of our friendly support team. 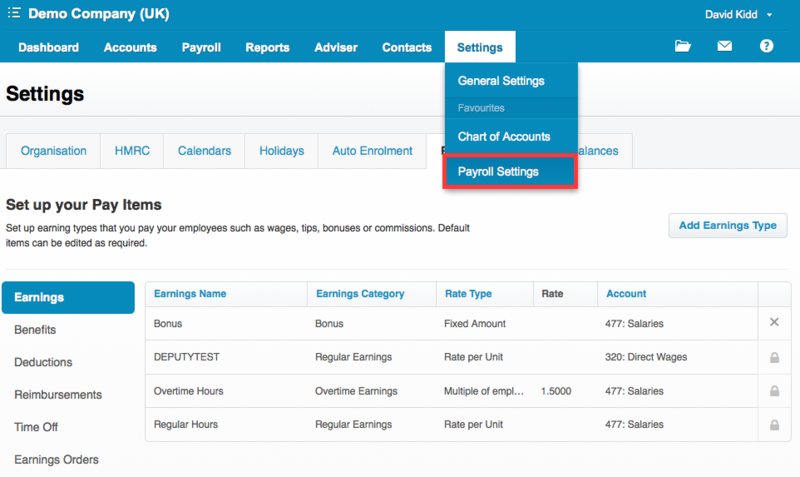 After creating your Pay Items, you'll need to assign them to your employees. To do so, please click "Payroll" at the top of the screen, then select "Employees". You'll see your staff listed below. Next, please select one to open them up for editing. After opening an employee's profile, please navigate to their Pay Template. The Pay Template is a list of rates an employee can possibly be paid. You should not have more rates applied to an employee than necessary. 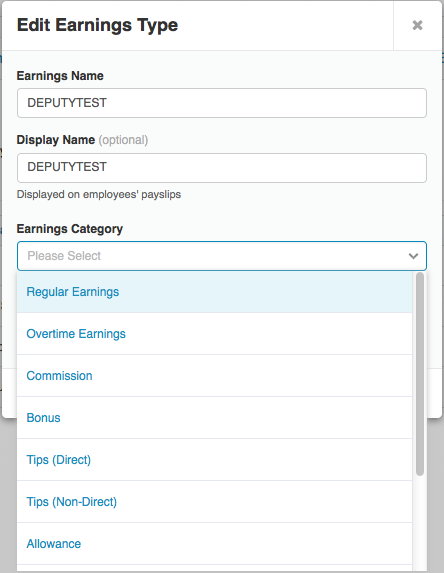 To add one of your created Pay Items to an employee, please click +Add New Earnings. You will then be able to select one of your created rates. When selecting the Earnings line, you will have the option to assign it a number of hours per week and a value per hour. We recommend setting the number of hours as 0, however regardless of the number set it will be overwritten on export, as we'll show later. After adding the rate please click "Save" at the bottom of your screen. When you later export the employees' hours to Xero, Xero will by default pay the Pay Item set as the employee's Salary and Wages Item. This is found under the Employment tab when editing that employee. You may adjust this by clicking "Set New Salary and Wages" as shown. Please ensure that in this section you set the Hours as 0. On this page you may also set the employee's Payroll Calendar (which must be done for you to export). Now that your employee has all of their pay rates assigned to them, you'll need to pull those rates to Deputy. Assuming that you have assigned your employee all necessary pay rates and have connected your account to Xero, you'll be able to pull the rates into Deputy. NOTE: If you do not see the options displayed below, it means you have lost connection to Xero. Please reconnect, as shown in the Before You Start section. To pull an employee's pay rates into Deputy, please first go to the People page. After doing so, please click "Options" then "Edit" next to the employee. This will open the employee's profile for editing. Please then scroll down to the Pay Rates section, where you will see an option reading "Pay Rate Handling". If you are connected to Xero, you will have the option to switch this to "Automatic", as shown. Please do so, then click "Save". This will pull the employee's rates to Deputy. NOTE: This will only pull the rates once. 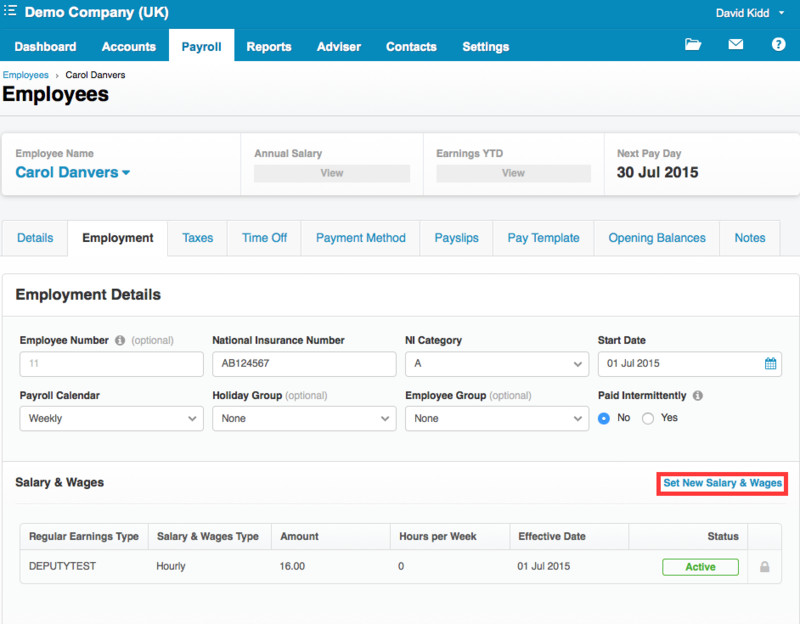 They will not update automatically if you change the employee's Pay Template in Xero. If you have adjusted the employee's Pay Template, please follow the below instructions. First, please go back to the People page. You will see a small checkbox next to each employee. Next to those employees you wish to pull the rates for, please select the checkbox. Next, click "Bulk Actions" at the top of the list. You will see an option reading "Sync with Xero". Please click it. We do not recommend syncing more than 10 employees at once, as some may not sync correctly. After you have re-synced the rates, please approve your timesheets as shown here. This will ready them for export. you wish to export for. Please note that Xero cannot export timesheets unless a valid calendar period exists. Export your timesheets first in Deputy, then approve the timesheets in Xero. Once you have done this, open a pay run within Xero. 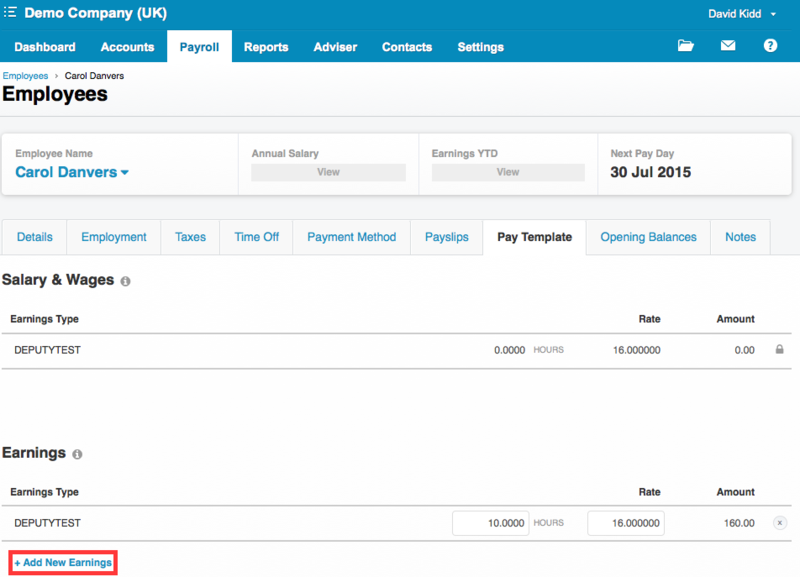 In Xero, first please click "Payroll" at the top of the screen, then click "Pay Runs". Next, please select the period you'd like to create a Pay Run for. If the options presented don't match, please select "Unscheduled Pay Run" which will allow you to select a relevant past period for export. After selecting your period, please click "Process Pay Run" on the right, which will create a Pay Run for you. 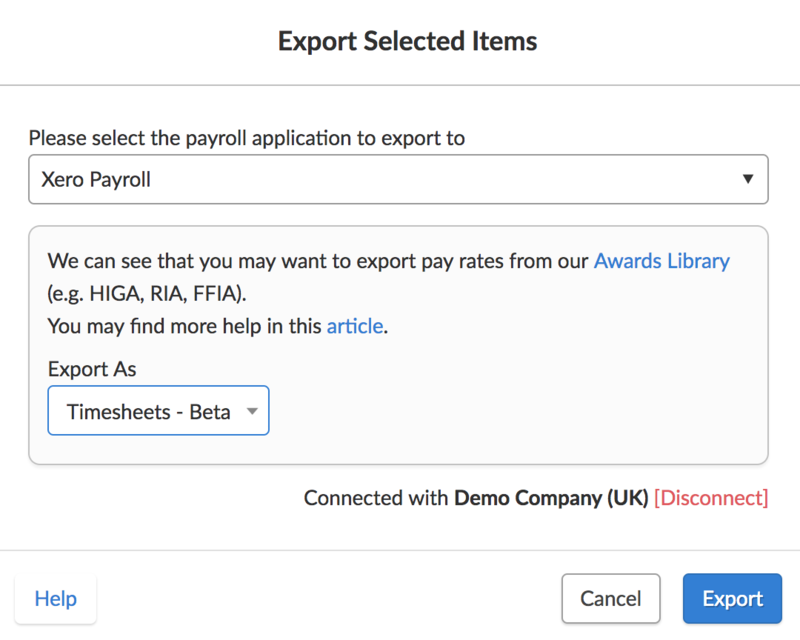 After creating a Pay Run, please go back to Deputy and navigate to the Timesheets tab at the top of your screen and select "Export Time Sheets". Select the date range for the export from the date selector at the top of screen. This must align exactly with the dates of the Pay Run you have created in Xero. Please select the employees to export on the left hand side. To quickly select all employees click "Select All". The details will then be displayed on the right hand side. Once you are ready to export, please click "Export Selected Items". 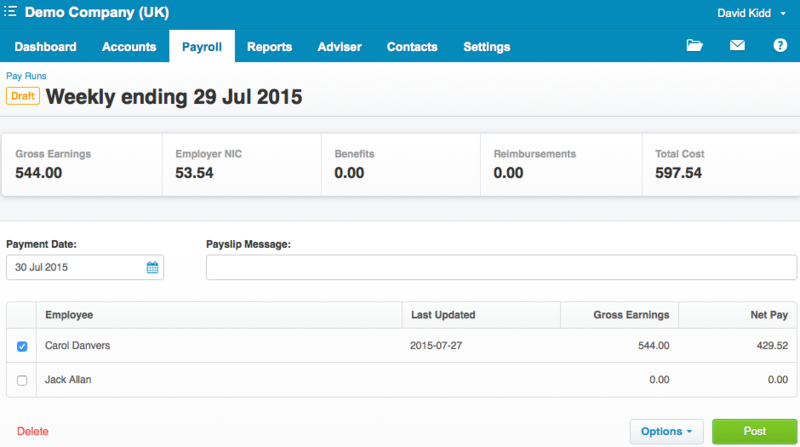 In the pop up box, select the payroll Xero Payroll (not Xero Payroll Timesheet Export). Finally, please press "Export" to ready the data for your payroll package. This will send the timesheets from Deputy directly into the Pay Run. You will now be able to find the data when you open the Pay Run and may post it as usual. With Xero UK, Deputy supports Payslip exporting. When you export as a payslip, please ensure that the base rate (Xero) and the pay rules (Deputy) are the same and that your ordinary rates are set up correctly. Failure to do this will result in errors between Xero and Deputy. NOTE: Please ensure that you do not have an existing draft pay run in Xero that matches the date range you are exporting from Deputy, otherwise the export will not work. 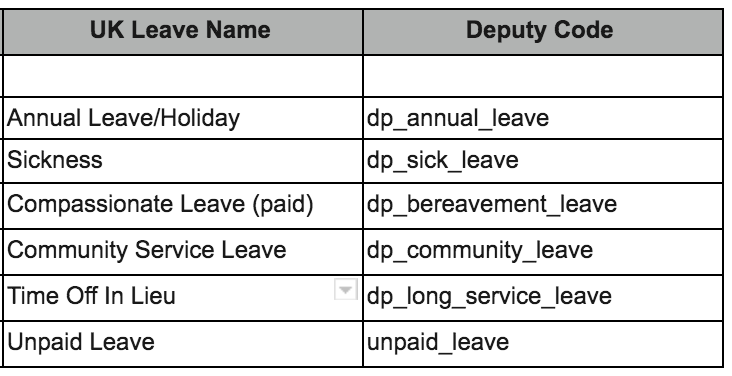 Leave types match in Xero exactly as they appear in Deputy. The below lists the types of leave we support with Xero UK. If they do not exist in Xero, you will receive an error message and will need to add it into Xero. Leave types need to be assigned to your employees in Xero. 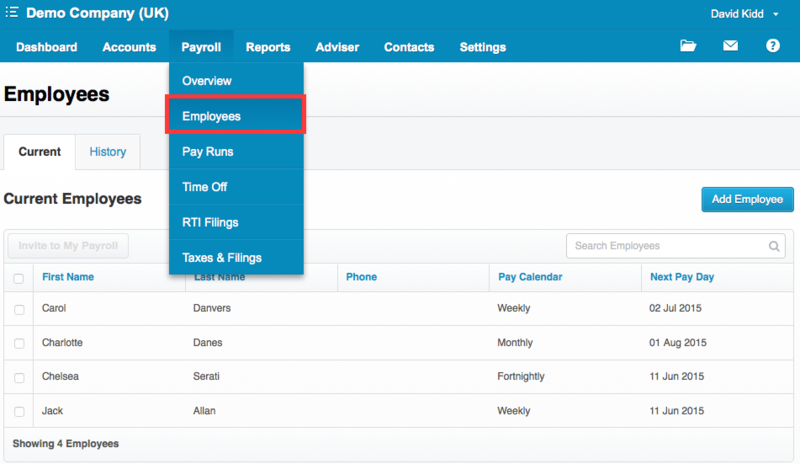 To do this, navigate to the 'Payroll' tab in Xero, then click 'Employees'. Select the employee you are assigning leave to, and in the 'Time-off' tab, assign the appropriate leave types. Leave timesheets cannot be used to update or delete leave balances. These need to be done manually. 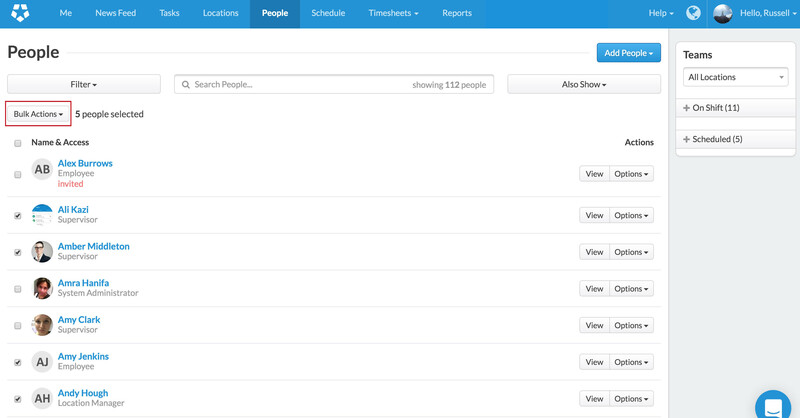 Xero Tracking works by matching areas in Deputy to Xero Category options. These should match between the two systems. To add a category option in Xero, navigate to 'Settings' > 'General Settings' > 'Region' > 'Category Options', then add the relevant area. For more information on Xero Tracking, check out our help article. Xero UK supports exporting from our Custom Awards Library. To submit an award or custom pay condition, please fill in the form here.